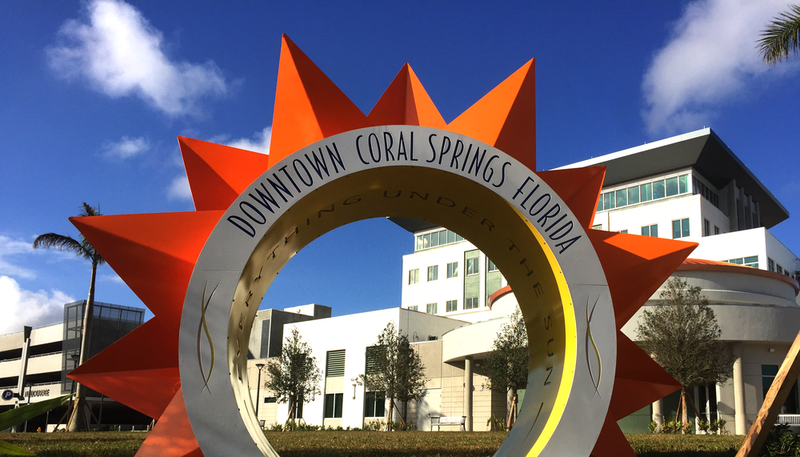 Coral Spring Municipal Complex — Song + Associates, Inc. This former suburban community has been redeveloped to create a vibrant and sustainable downtown in which residents, businesses, and visitors can live, work, shop, and entertain. At the epicenter of the Downtown District is the 75,000 SF Municipal Complex which includes the new City Hall, a Commission Chamber of 150 seats, meeting rooms for community organizations, future retail and cultural space, civic plaza, and a parking garage. The common green can be seen from the road and is anchored by the City Hall, which is located off of, but still visible from the road. The design includes pedestrian-friendly shaded walk areas. During the Master Planning, Programming, and Conceptual Design Phase, our team conducted a public workshop with residents, business owners, and students to obtain input from the community and build consensus for the development. The programming for the City Hall was developed through interviews with staff members from all departments of the city government. Interactive design workshops were held throughout the design and documentation phases with the City Managers, Commissioners, and the Mayor as well as business and community leaders. This project serves as a catalyst for further economic growth by attracting private developers to the surrounding sites to create a thriving mixed-use center. The Municipal Complex was designed with the highest standard of sustainability and energy efficiency within budget. During construction, a pollution prevention plan was incorporated, locally sourced building materials were used, and the natural habitat was preserved. Selective building fenestration with high efficiency glazing, low-flow plumbing, and low-energy light fixtures were used throughout the building and site. The complex includes bicycle and shower facilities for employees, access to Broward County Public Transit, charging stations for electric vehicles, as well as indigenous and low water consuming landscape. In addition, the entire facility is non-smoking.